In this Korean name, the family name is Lee. 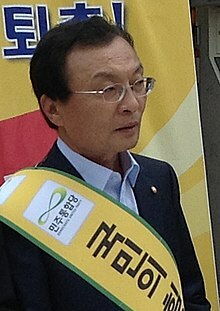 Lee Hae-chan (Hangul: 이해찬; Hanja: 李海瓚, born July 10 1957) is a Korean politician, journalist and writer. In 2004, he became the 36th Prime minister of South Korea. He was the 38th education minister from March 3, 1998, to May 24, 1999. He became deputy mayor of Seoul in 1995. Lee started his political career as an liberal activist. In 1988, he was elected to Parliament. He has been re-elected seven times since then; in 1988, 1992, 1996, 2000, 2004, and 2012. In 1995, Lee was appointed to deputy mayor of Seoul. He only had the job briefly, however, because he resigned. From 1998 to 1999 he was Education Minister. During that time, he made reforms to education in the country, fought corruption, bribery and incompetency in schools, and reduced the age of retirement. This page was last changed on 14 June 2017, at 05:22.